Just like that, fall is nearly here, but before we bid adieu to cut-off shorts and swimwear and brace ourselves for new-season trends, we must consider our selection of wedding guest attire for end-of-summer nuptials. An idyllic time to attend ‘I dos’, August and September weddings promise warm breezes and sunny days, making it a prime opportunity to don vivid colors, skin-baring silhouettes, and flirty fabrics before the turn of season. Best-dressed guest goals aside, you may find yourself gravitating towards a fresher look (especially if you’ve attended upwards of five or six weddings throughout May, June, and July), in hopes of shaking things up, sartorially speaking. Fortuitously, fall’s latest and greatest pieces are hitting stores now which means new arrivals abound from feminine dresses to glamorous gowns and killer jumpsuits. Plus, statement-making accessories for a fashion-forward touch. Whether you feel like you’ve exhausted every cocktail piece in your closet or simply want to peruse the latest offerings, we’ve curated five fresh-for-the-season wedding-guest outfits for a range of venues and styles. Cheers! Summer is the season for going bold, especially in the color department. Break from expected hues like red or Kelly green and give a fierce shade of fuchsia a try before the season ends. Continue to dial things up with vivid accessories—a tonal heel and yellow bag will denote your daring taste (hot tip: citrus shades work really well together) while a sleek pair of hoops ensure an elegant finish. 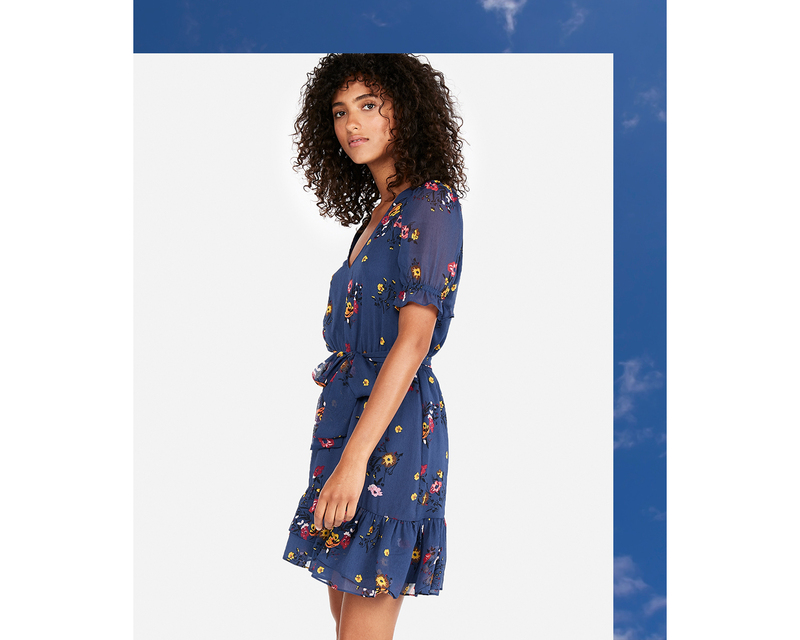 For a laid-back venue, a frilled floral mini dress is at once subtle and stand-out. Puff sleeves give this number a forward effect while ’90s-inspired kitten heels and two-tone earrings serve as quietly chic accents. Jumpsuits are our favorite way to break the wedding guest mold, especially one with slinky side-cut outs and an open back. For added glamour, metallic extras compliment a vibrant—we’re for golden stilettos, modern earrings, and a chain-strap bag. Whether you’re a slave to black or are feeling something moody, a high-neck noir gown with a slit up to there delivers with impact. Dip into just-glamorous-enough extras for a cool finish—rhinestone-adorned heels, a metal mesh clutch, and oversized silver hoops are achingly chic. Wham, glam! High-octane pieces á la the ‘80s are coming in hot for fall, but that hardly means you have to wait until then to rock the trend. End the summer soiree season on a high note in this multicolored sequin shift and glimmering minaudière. Temper the rest of the ensemble with black strappy heels and slim pavé hoops.